A leaf pattern done in six colours. Another detail with gold beads. 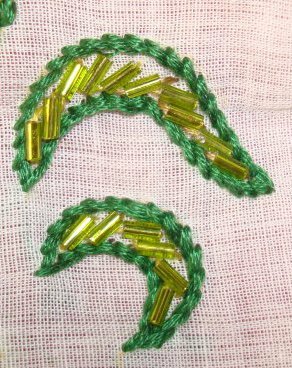 Leaves outlined with stem stitch filled with green bugle beads. Eagerly waiting for the next stitch in the TAST challenge. When the 15th week stitch of the TAST 2012 challenge was on SharonB’blog, I was on stitch -free vacation. 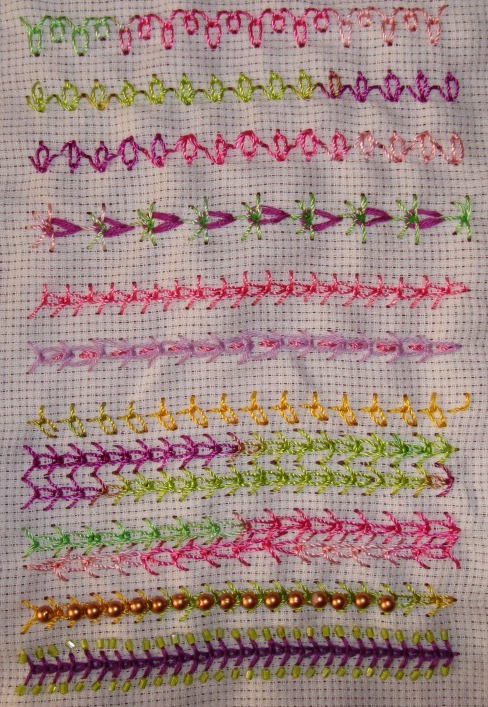 Now that I have completed this week’s wheatear stitch, thought of working on stem stitch sampler. 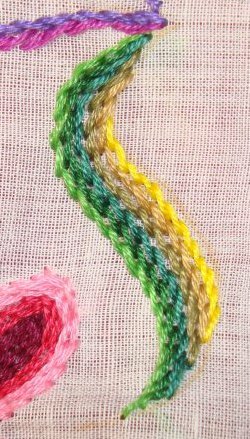 I don’t see many ideas regarding this stem stitch, though I have used it before on my embroideries. This led to the practicing of stem stitch on some floral designs. Paisley pattern in four colours. A design done in blue and light violet. 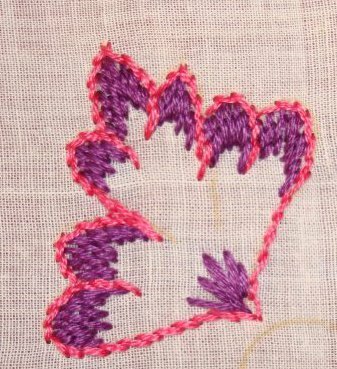 Shaded effect with stem stitch filling. A flower in three colours. Rest if the variations of the wheat ear stitch of the TAST 2012 stitch challenge by SharonB. 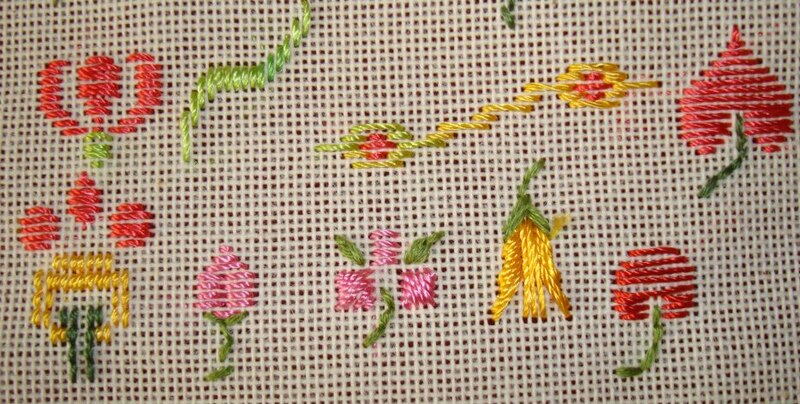 In this row the straight stitches are done after working the detached chain stitch. When worked individually they look very pretty. But I worked them in a row. The same individual wheat ear stitches are worked in opposite directions, in this row. In the next row , instead of two straight stitches, I worked five straight stitches and worked the detached chain stitches in different colour thread. In the first row, the straight stitch is taken vertically on one side, and on the other side it is worked diagonally. A row wheat ear stitches are worked over a row of detached chain stitches. I tried working individual wheat ear stitches diagonally to form a row. Two rows of wheat ear stitches done with variegated thread. Two rows of wheat ear stitches worked facing each other. I tried adding beads to this stitch. 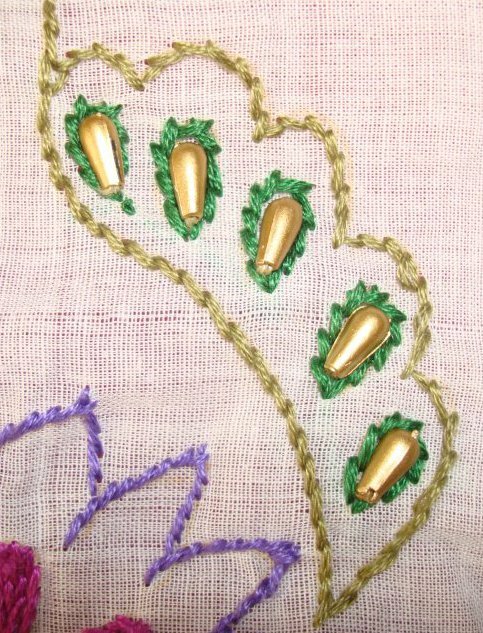 In the first row, the beads are worked on to the chain stitches. 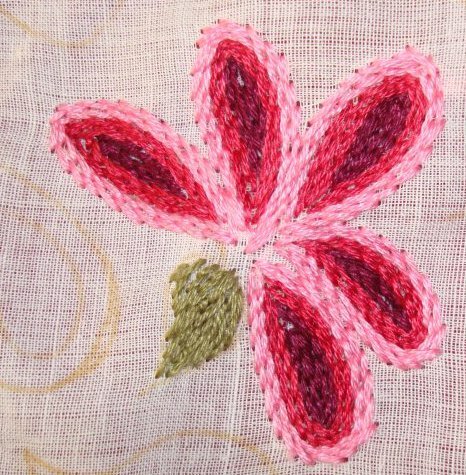 The 17th week stitch of the TAST 2012 stitch challenge by SharonB is wheat ear stitch. 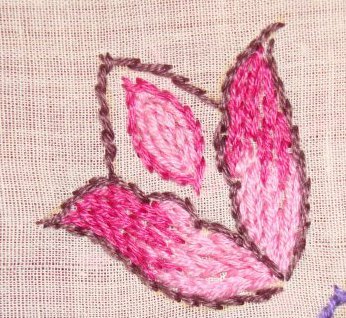 Though the wheat ear stitch is quite simple, I had not worked this stitch before. 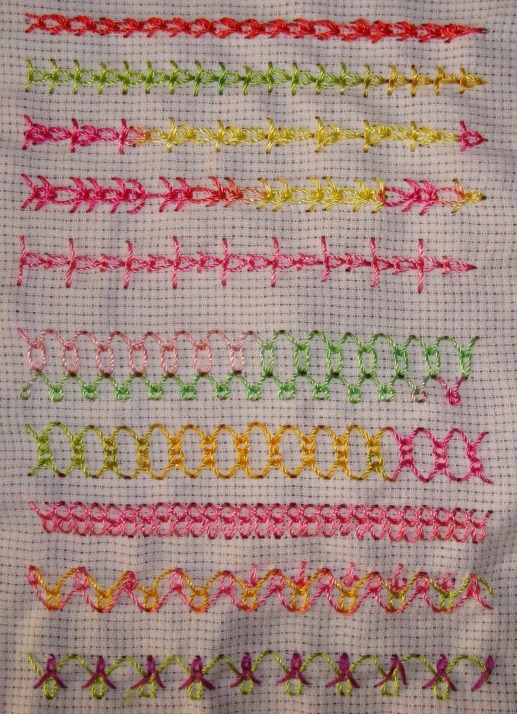 This week after completing the satin stitch sampler, I started with this stitch sampler. I found three treatments of this stitch on books. The straight stitches are worked diagonally. The straight stitches are worked vertically. 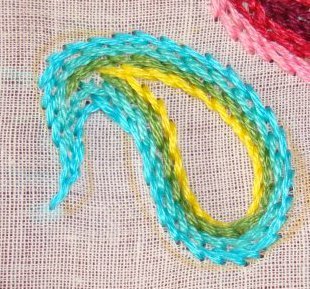 For individual stitches, the straight stitches are done after working the detached chain stitch. I tried all the three . The first row the straight stitches are worked diagonally. The second row the stitches are worked vertically. In this first row, I tried alternating the angles of the straight stitches. 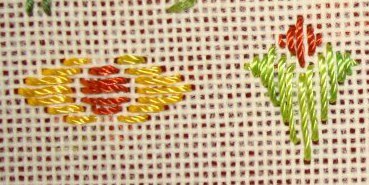 In the next row the length of the chain stitches are varied. This row the length of the straight stitches are varied. Two rows of wheat ear stitches are worked in opposite directions. In this row the individual wheat ear stitches are interlinked. In this row too, the wheat ear stitches are worked in opposite directions, but the placement of the stitches in the second part is different. I tried working some fly stitches into this row, but later gave up the idea. In this row individual wheat ear stitches are worked over a row of continuous wheat ear stitch. In this row, the wheatear stitches are worked in varying sizes. 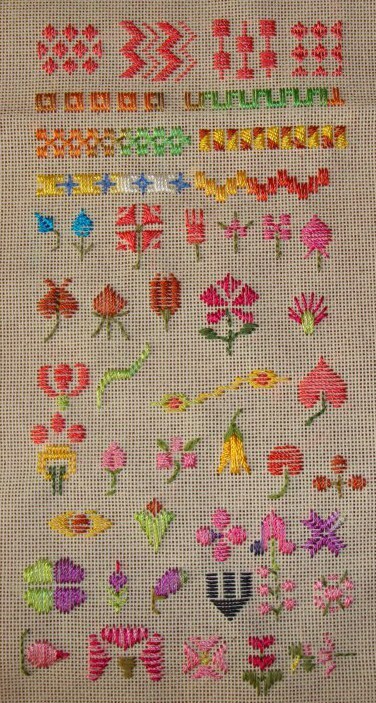 After working a few more motifs in satin stitch I completed this stitch sampler. More designs are available on the downloaded books. Along with the floral , the border pattern also captured my interest. A geometrical pattern and a flower. The last set of designs in satin stitch. 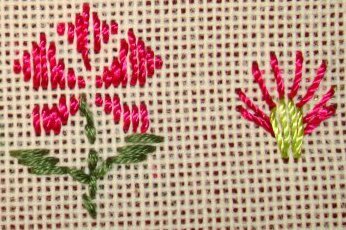 The complete set of floral pattern done in satin stitch. The satin stitch sampler done on canvas. 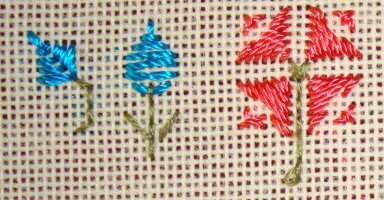 The idea of working satin stitch sampler with these antique patterns came when this stitch was part of the challenge on stitchin fingers. I did not work on it at that time. With this TAST 2012 challenge, I took the opportunity to make use of those patterns. 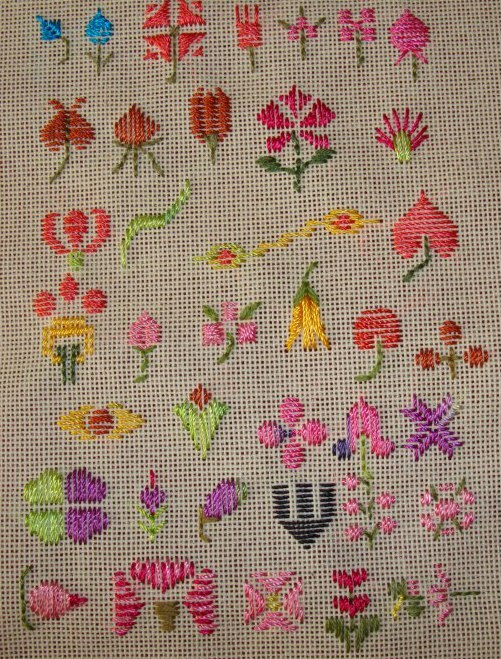 I started with some floral motifs worked in satin stitch today. These motifs are all from the pdf file downloaded from antique pattern library site. These patterns were part of borders, fillers. I chose to do the motifs alone. 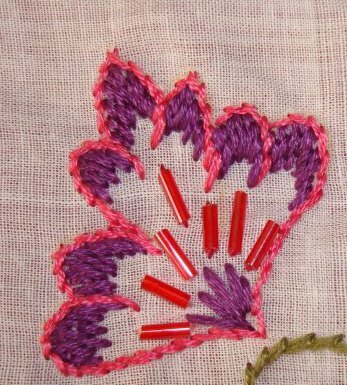 The florals are worked with cone thread[available in India], thickness similar to perle cotton thread. Straight satin stitches worked on canvas with this thread, leaves gap in between the individual stitches. I found still more satin stitch patterns on the old book, so might try some of them . 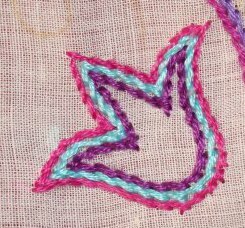 In this satin stitch sampler, today I tried some border patterns. These are worked from patterns downloaded as pdf files from antique pattern library. 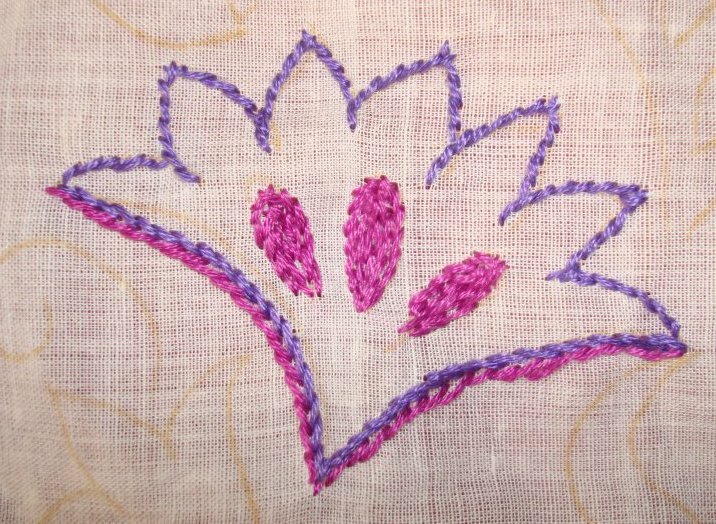 Satin stitch worked in a continuous pattern. 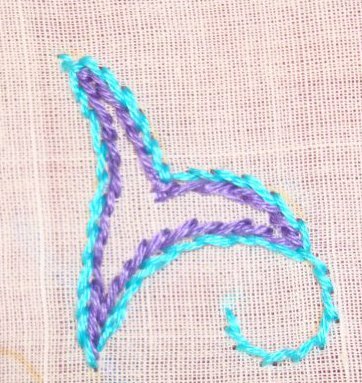 satin stitch in two colours. 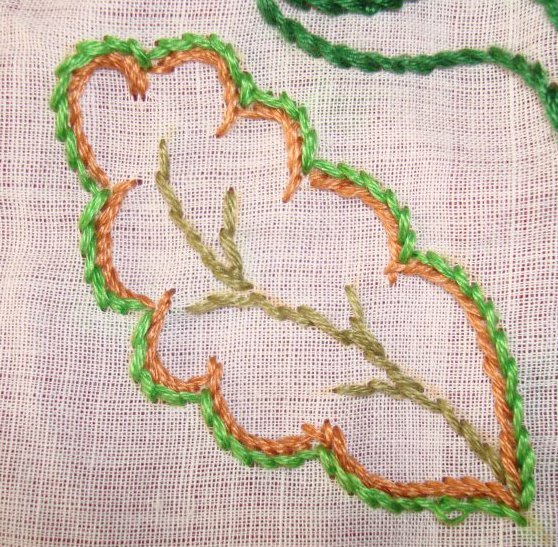 A combination of satin stitch and cretan stitch variation. Border worked in satin stitch with variegated thread. Tomorrow some motifs taken from the same old patterns .